Some of the Stack Overflow moderators were having (yet another) discussion about what makes "not an answer" fundamentally different from "very low quality", since the former implies the latter in a significant number of cases. Since Stack Overflow can easily hover at close to a thousand pending flags during peak use, moderators are always looking for new ways to let people in the community do more. The "very low quality" flag has always been ambiguously defined because (as Jeff Atwood once put it) "toxic waste" comes in a variety of shapes and sizes. "You know it when you see it" I used to say. "It's incomprehensible gibberish" others have said. As a moderator, I'd often wonder if some folks had fallen asleep and just rolled their head around their keyboard while servicing these flags. See the flag, get the full context (parent question if applicable, other answers, comments, tags, etc.). Make an edit (or maybe not). Dismiss the flag. Often, if I could sort of see why someone would have flagged it, I'd consider it a good-faith attempt and validate the flag. By way of comparison, it was rare that I'd take the prescribed action, which is delete with extreme prejudice if there was any substance to the flag. In most cases, I just didn't know for sure, because while I was a pretty good objective judge of quality, I had little to no domain knowledge. Why did we make this a moderator function, anyway? They know the system, and how it works. They know that Incorrect or sub optimal != Low Quality. They're in a better position to decline these flags as an attempt to use a moderator as a proxy to delete stuff that just mildly annoys someone for some reason. They know the topic and can identify when something is really coming out of some strange place in the cosmos, and has no relevance to the question at all. They know when a question is just an unanswerable mess that can't possibly be salvaged and might be able to help people avoid pile-on downvotes by quickly guiding users with something more helpful than "maybe try again". What are the drawbacks of, say, opening at the silver tag badge level, allowing users to validate (somehow) or dismiss those flags? Should we open up a review queue just for this? How might that work? What should happen if two people with a silver badge agree on something being low quality and how do we surface it to them? As we look through places where all of us would agree that users didn't get treated very well, there's this certain subset of questions where—well—there's just nothing nice or encouraging anyone could say about them. These questions turn out to bring out the worst in people and just make lots of ugly. Moderators hate stepping in when you really need domain knowledge to make a call, yet they hate seeing folks have this experience, and we've been debating how or if this flag should even exist for years. How can we totally offload VLQ flags safely? What did we learn from the dupe-hammer initiative that applies here? Should we set up a review queue, revamp the helper queue to service this, or...? Maybe just handle it from... something else? We need some input. This is currently just blue-sky thinking. But Shog and I always meant to do something with silver tag badges (in fact, I think he's typing his ideas on an implementation right now), but we wanted to get your ideas right now, as we do this, to see if there's any merit here in going further and writing an official specification. Let people with proven knowledge handle VLQ flags without moderator help. Part of this discussion is to define 'handle'. As they do that, let's decide if it's of any use, and how it could be better. Make sure any implementation improves the user's experience, even if it means deleting something quickly with some guidance (think outside of the box all you want here). Make sure there's a feedback loop so flaggers can hone their skills. Anyone want to chew on it more? We're open to trying ideas and even getting a little nuts, but we need way more input than just Tim and Shog thinking about it in a back room. So, instead of getting an internal specification together to discuss externally, we're going to get an external spec together to discuss internally. How could this work? What do you think? Is a cheese pizza with Canadian bacon really just very low pineapple? Let us know. We hope we can get enough ideas and concerns together to get a formal specification that we might be able to put into testing, but let's just start with the ideas part. Four months ago, I promised a follow-up answer with a concrete proposal. The first direction involves building an increasingly-detailed set of Q&A on broad, popular topics. This is the easiest one to observe: if you're learning, say, C# then you'll find a very broad and deep set of information here, with more and more corner-cases being filled in hourly. The single biggest obstacle here is noise: with almost every possible topic covered in multiple questions expressed in multiple ways from multiple perspectives, finding a question that seems to match the problem you're having is easy - but finding the question that has an applicable answer can be a slog. The second direction involves covering an ever-more-vast set of topics. Everything from languages and platforms with only a few (initial) users, to specialized libraries and tools nominally under the umbrella of a more well-known language or platform. The big problem here is (and has always been) that these topics are nearly impossible to moderate effectively; they may have only a tiny handful of active users, they tend to not attract much voting, and the bulk of the moderation tooling (and elected moderator team) is skewed toward serving #1. Solving the problems of #1 is... An almost insurmountable challenge. We tried hard to attack it head on, and eventually came to the conclusion that we could probably throw a billion dollars in dev time at it and still only maybe succeed; the root causes are simply a lot bigger and broader than the little Q&A site they affect. That doesn't mean we shouldn't try to mitigate those effects, but it very much means we should do so while compulsively reciting the serenity prayer. For the first five months on Stack Overflow, anyone who could scrape together 3000 points could close any question - and reopen any closed question. That was a pretty high bar for who could moderate at the time, but made it very easy to moderate for those who earned the privilege - and put no bounds on what could be moderated. Starting in 2009, closing became a vote-based system... And almost immediately, it became apparent that stuff in less-popular tags just didn't get closed. The immediate solution was to stop aging votes on questions that weren't getting many views... This didn't actually solve the problem, but it made it feel solvable in some vague way. Soon afterwards, the VLQ flag was introduced... Mostly because folks kept typing "this is very low quality" into the "other" field on the flag dialog. Jeff started just deleting questions flagged as such. This actually did help for a little while, possibly at the cost of Jeff's sanity. A couple of years later, we introduced /review for pending close votes, with the ability to filter by tags. Again, this didn't really help much, but made a solution look even closer albeit still just out of reach. We optimized the hell out of this tool, achieving at best limited success... And at the same time increasing the instances of questions being moderated by people who had no knowledge of the topic being moderated whatsoever. A couple years after that, we introduced Mjölnir, which helped a LOT... for tags that had at least 200 questions, all answered by the same tireless person. And with the exception of Mjölnir and the original long-forgotten closing system, nothing we've ever done has really worked for tags with only a single knowledgeable user monitoring them. There's another way in which much of our tooling has failed us when it comes to niche tags: it has too often created an inherently combative or judgmental relationship between contributors and maintainers. No matter how nicely-phrased our close reasons or canned comments may be, the subtext is always the same: you have been weighed and found wanting. And each time, our solution to this problem - going all the way back to 2008 and the introduction of close voting - has always been the same: make the tools harder to use. Require more people, more votes, more effort for them to become effective. Frankly, this hurts everyone - but none so much as the already-beleaguered maintainer of the niche tag, already over-extended and under-appreciated. It's time to put an end to that strategy. If quality and kindness are truly "a false dichotomy", then our tools should reflect this: they should be effective at encouraging quality while at the same time expressing kindness. Responsible use should benefit both those who are invested in monitoring a given topic and those who seek to learn about the topic by asking questions. Upon submission, the question will be immediately deleted, the viewer's input will be rendered as a comment, and the author of the question will be notified via their inbox. If the author edits it, the question is automatically and immediately undeleted. Badge-holders will only be allowed to delete any given question once. If three separate badge-holders each delete the same question (it having been undeleted twice following the first two deletions), the question will not appear to the author as awaiting edits; it will show up as deleted and edits will not immediately undelete. We may wish to raise a flag or put the post into a queue in this scenario. Badge-holders will be allowed a limited number of deletions per day, based on the rules that currently apply to 10K users. Neither the badge-holder nor the asker will be allowed to comment on the question until it has been undeleted. The asker may raise flags on both the question and comment(s) if need-be. Moderators would also be provided this "delete and request edits" option on all questions, in addition to the normal "delete" option. A report should be provided for moderators and 10K users to allow oversight of the use of this feature (site-wide and per-tag). What does this have to do with offloading VLQ flags? Based on some scans I did of the access logs, badge-holders already visit quite a few VLQ-flagged questions without needing any extra encouragement to do so. And... Also are the ones raising VLQ flags in some non-trivial number of cases. This would hopefully replace the latter with a considerably more useful action, and deletion would automatically handle any pending flags as well. Wait, so your solution to handling VLQ flags is to replace them with something better? For questions, yeah. They've never really worked very well; every alternative just worked even less well. Why deletion? Why not closing? Didn't you mention something about closing in your last answer? Closing has a lot of baggage, both as a concept and in terms of implementation. There are a lot of unfortunate assumptions regarding what it does and how it should be used that don't really satisfy the requirements I outlined above. In particular, closing doesn't immediately get rid of the question - if your goal is to gently, kindly, get rid of a really ugly question so that the author has a chance to fix it... Then closing it doesn't do that: it keeps it around, visible, for a few days while folks mostly jeer at it and throw rotten produce. Won't folks just make pointless edits and go back to junking up the site? What gives you the idea this will even work? We've been doing something very similar for low-quality answers for quite a few years now; we don't even require edits - the author can just undelete at will. It rarely happens, but when it does a decent number of the answers actually were improved. But more than that... We've been practically begging folks with closed questions to edit them for ages, and still most do not edit. The problem there is, when they do edit it takes a lot of work to get the post reopened; by the time all is said and done, it's taken 10 votes to go through that close-edit-reopen cycle. This proposal requires one person besides the asker to be involved in the common case; worst-case, three people. I realize that this... probably sounds a bit drastic. That's what has kept me from posting it for months now. But I keep running into situations where folks are trying to do the right thing: ask questions, encourage new askers, maintain their topics... And having to fight the system every step of the way. We need to break out of this drama triangle; after an awful lot of soul-searching, I believe this is the simplest thing that could possibly work. I have a lot of thoughts on this... I may add more later, but to start with I want to lay out why I think this has merit. I'll apologize in advance; this is a bit stream-of-consciousness. For now, I'm only going to talk about VLQ as applied to questions. It's also a useful flag for answers, but... Honestly, we could probably get rid of it without too much pain; not only is Not an Answer a much more common flag, 44% of all answers flagged VLQ also get at least one NAA flag. We could, as Yvette suggests here and as many people have suggested in the past, just combine the two flags. OTOH... There's not a lot to gain there either, we'd almost certainly see an increase in "in need of moderator attention" flags (which MUST be handled by mods) and there's a LOT of plumbing that'd have to be adjusted. Questions are another story... Your other options are Spam, Rude/Abusive, In Need of Moderator Intervention... and a big ol' pile of close flags. And there is no Very Low Quality close flag. Every question posted represents a sincere desire for help by a struggling programmer who deserves our patient attention and guidance. ...what? You disagree with that? You heartless monster! OK, fine, we all know that's not... strictly... true. There are a LOT of questions that aren't very good, and a noticeable amount that are, no matter how sincere, beyond our help. And... The latter are particularly demotivating, in the same way that spam is demotivating: it makes the place look trashy. This was the original purpose of the VLQ flag: treat exceptionally poor questions like spam. Get rid of them ASAP. But... we kinda lost track of that. I think we need to be able to get rid of very poor questions as quickly as we do spam. The volume is comparable: about a thousand questions a month, give or take. That's not the volume of VLQ flags; that's the count of VLQ-flagged questions that are deleted relatively promptly. I say "relatively" because the average time to deletion is a bit over 3 days, compared to just over 2 hours for question-spam, 45 minutes for answer-spam, and about 5 hours for VLQ answers. The median time to deletion is about 11 hours, compared to 1 minute for spam. A too-localized, vague or overly-broad programming question? Meh. Just close it and move on. Yeah... 2013 me was kinda naive. Well, even more naive. Don't get me wrong; I'm still pretty happy with how automated deletion has panned out - but the idea that there is no cost to closing, or leaving egregiously-bad (but sincere!) questions laying around... was, uh, stupid. ...is the downvote button and the waiting game and maybe, if you're very, very lucky, an appearance on the 10K-only "delete votes" page. Yeah. I dropped the ball. Sorry. Now... We've had our disagreements about what constitutes spam. But that's nothing compared to how much we've argued over how terrible something must be to qualify as "very" low quality. Bad grammar? Poor formatting? Unclear to the point where even tagging is a guessing-game? Straight-up gibberish? But here again, spam gets a better deal: about 73% of spam on Stack Overflow is deleted by ordinary users flagging it (in under 5 minutes). For most spam, mods don't even have to be aware of it, much less agonizing over whether it truly pushes the limits of what is allowable; if they even see a spam flag, it's probably borderline enough to warrant a bit of extra time and analysis. ...so is that. While certainly well-intentioned, this isn't good for anyone: the asker didn't get what they wanted, the would-be good Samaritan got a slap in the face for their troubles, and nobody learned anything except maybe "don't try to help". More fodder for the "Stack Overflow is elitist and unwelcoming" crew. ...and I think each of those should be just slightly harder to impose than the previous. If I can unilaterally edit, then it should take two people to close and three to delete. Not close and then delete; just straight-up delete. If three people with demonstrated experience in a tag agree that a question is an eyesore with no chance of redemption... Just get rid of it ASAP. That still leaves a lot of open questions: what should "demonstrated experience" mean? How should flags get exposed? Should we finally pick a better name for this flag than "Very Low Quality"? But, it's supper time. Sorry for this rambling response; I wanted to get some context hammered out while it was fresh in my mind after pondering this idea... More specific ideas tomorrow. Start with an edge case. 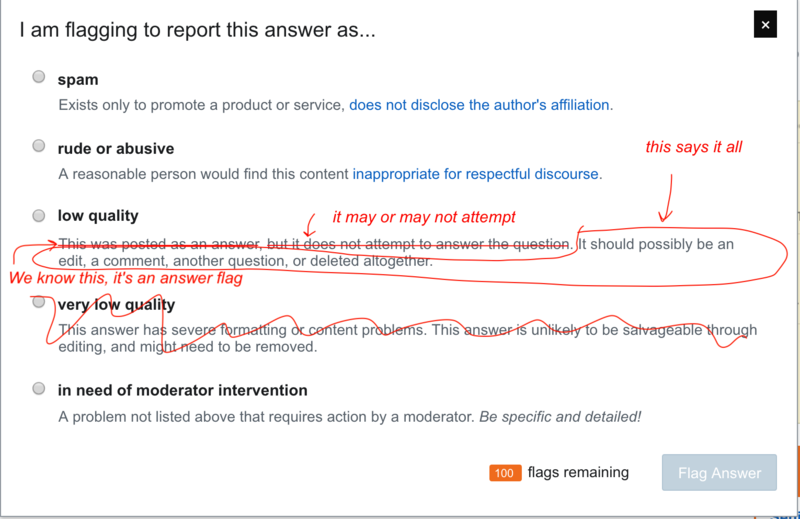 One problem with the low quality flag on answers is it throws those posts into both the review queue and the moderator queue, and if the person has flagged it, as it's giving "very bad" or "wrong" advice that then leaves it to people who may not be experts in that domain to decide if this is true. From this viewpoint, it would be a great idea for silver and gold badges to review these types of posts. Should these types of answers be downvoted? In all honesty, the criteria for raising this type of flag are unclear and your question has demonstrated how it is not clear, as you're now saying it takes experts to review those flags. The implication being, the answers have a "decent" level of content - as least superficially. Can we combine the two flags (NAA and low quality) into "Should be deleted"? If a user is especially concerned they could add comment, for reviewers to see, why it should be deleted. If you then choose to add a search option on the low quality review queue to filter by tags, maybe that would be a simpler solution. Or combine those and then create one for content disputes, which is probably what a lot of people would prefer. It's a little confusing, a foot in each camp. 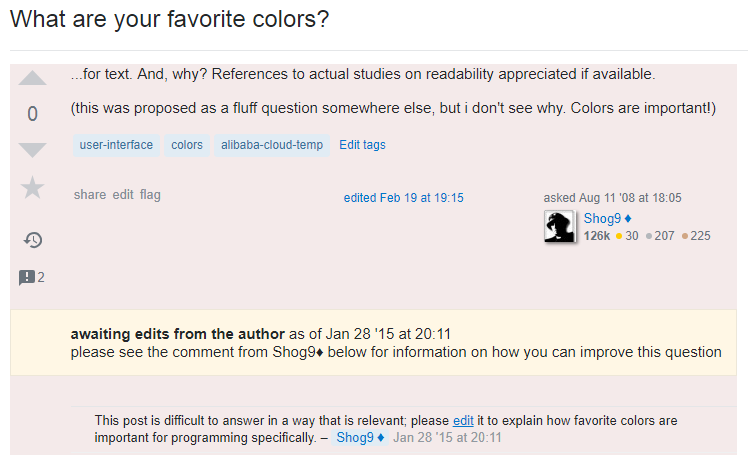 Either you want poor quality answers deleted from the site or you want them downvoted. Judging the line between what makes an answer poor quality and an answer can become arbitrary and posts like You're doing it wrong: A plea for sanity in the Low Quality Posts queue make it all the more confusing, in that we are supposed to leave this content on the site. The community has been asking for this for a long time now, and it would be good if we could finally address it. This should not be taken completely away from moderators. Like Erik commented above, this could easily be a problem with VLQ flags on questions with low participation languish for days. Let the community start handling these flags, but if they expire, send them up to the moderator queue. I'm not sure this should be opened to silver badge holders. At least not to the same degree it is opened up to gold badge holders. If we are talking about the community being able to delete content on their own, that means a couple people with 2k reputation could start causing answers to be deleted through their own action... something that normally isn't possible until 20,000 reputation, which is an order of magnitude more reputation and 'trust' afforded by the system. There are a lot of silver badge holders who know enough about a language or tag to be dangerous, but can still be wrong a lot of the time. I am only a few points away from a gold badge in css and I am definitely still wrong about CSS questions or answers sometimes, either by thinking the wrong thing is true or by misreading what someone wrote in a question or answer. On that note, why not a hybrid set of requirements? A gold badge and, say, 10,000 reputation (just an example) are both needed to use this queue. Or a silver badge and 15,000 reputation. This would ensure both some significant level of trust from the community that they know what good content is (because they produce it) and they have some subject-matter expertise in a tag. Servy makes a good point with his comment; we are told a lot that VLQ is for indecipherable garbage or something that would happen if a cat decided to participate in a programming contest. If we are going to start prescribing more power to people who are SMEs in a given tag, what does that mean for the definition of VLQ? Are we now supposed to flag wrong answers as VLQ? Or were we always? I thought we were only supposed to downvote wrong answers (and delete-vote them if we have 20k reputation). When dealing with Very Low Quality flags you really have two very different types of posts that are involved. There is the official guidelines on what the flag is actually supposed to be used for: complete an utter trash, things not even resembling an answer to the question, stuff not even in a position where it could possibly be judged on any technical merits to determine if the answer was even a wrong answer. Then there's the common misconception of what it means given the (rather misleading) name: that it's for low quality answers, answers that are wrong, fail to answer the question even though they attempt to, have major technical inaccuracies, or are simply written poorly enough to just not be a useful answer. When it comes to the first category of posts, the flag is simply not useful. Any answer that is really that bad, to the point that it's either incoherent, or very demonstrably not a sincere attempt at answering the question, is already covered by the Not An Answer flag reason. I have never seen an answer that actually merits a VLQ flag that didn't also meet the NAA flag. If the only goal here is to make sure that those types of posts are flagged and dealt with accordingly, all you really need to do is remove the flag and let people use NAA instead. Some people seem to think it would need to be re-worded to accomplish that. I personally don't think that would be necessary, but it's possible that something clearer could be found. As for the second category of posts, if this is really a suggestion that the flag's purpose and usage be altered to be a means of flagging said posts for deletion by the community, as the question implies by suggesting the flags be handled by people familiar with the topic, I think it's quite a poor means of doing so at best. Here, again, other tools generally do quite a good job of handling the situation. Downvotes and comments are quite useful for answers that are simply wrong, unclear, or just otherwise not very good answers. Rare cases where an answer is suggesting something that's actively harmful can be deleted by 20k users. Deleting said posts is rather hard, but said posts are also uncommon, and honestly I think it's appropriate that deleting such posts isn't easy, as it is effectively a way for a small handful of users to override the community's ability to even provide feedback on a post, which is a rather extreme measure. If we think that it needs to be a bit easier to delete posts that are very clearly answers, but that the experts in the field feel strongly are very harmful, then we don't really need to radically change the system, nor do we really need to use "very low quality" at all. If you want to make it a bit easier for said answers to be deleted, then perhaps the privilege to delete an answer should be lowered a bit, or perhaps users with a gold badge in a tag should have the 20k privilege to delete answers in question that tag, even if they haven't reached 20k yet. Personally I think that a silver badge is probably not a high enough bar for such a privilege, but if you think that they should be qualified to vote to delete posts based on their technical merits then just give them the delete privilege rather than trying to shoehorn in the VLQ flag somehow. As for a review queue of some sort, I'm pretty strongly opposed to that one. The whole design of a review queue is that it's a way of helping people find posts that they normally wouldn't have interacted with (either because it's not in the tags that they frequent, or because they looked at the title and specifically decided not to look into that question because it wasn't something that interested them). For the existing queues that's fine because they're not expecting much, if anything, in the way of subject matter expertise. The whole goal of those queues is to help people find posts outside of their areas of expertise that they are able to moderate. But when it comes to the very specific case of an answer being so harmful on its technical merits that it deserves to be deleted without the ability for others in the community to even be able to see it or give feedback on it, we just don't want that. The only people making those decisions for the post should be people who would feel comfortable enough to go to that post and interact with it without being directed their by a review queue for that specific purpose. If, on the other hand, the goal here is not to remove particularly egregious answers (on their technical merits), but to actually delete your average, run of the mill, low quality answer, once again, the VLQ flag isn't really a good way to accomplish that. If the goal here is that for answers that are just generally poor, and not useful, but no so egregiously harmful as to require 20k (or other previously suggested) users to delete them, then just use downvotes for that. If we don't feel that deleting an answer should require such a high qualification, then simply "delete" answers that have a low enough score (perhaps something like -6). Maybe this would even be a different type of deletion than what we currently use the term to mean; maybe such an answer would just be hidden to users without X rep, or without a silver/gold badge in the tag (and that would allow upvotes by any user that could see it, potentially bringing it back above the threshold). I don't really think that answers of this nature need to be deleted or otherwise restricted so strongly, but if these are the types of answers that the community in general wants people to not be able to see then, again, there's no need for a review queue for it, let the people voting on the posts, the people who have come across the post naturally because they're actually interested in that question an invested in it getting good answers, make that call. Merge NAA and VLQ into "Should be deleted". Just today I got into two separate discussions about keeping some poor answers. Both were technically answers, but not very good ones. It's hard to convince people that junk/noise shouldn't be deleted just because it contains some shred of an answer. So let's drop the pretense and just make them one flag. Solves the confusion and it means we can more readily nuke noisy answers. Give silver and gold badges a one-shot delete in the LQP review on things in their own tag (provided they have at least a bronze badge in LQP). It has always baffled me why there are two separate flags. Just merge them and let them all of them go through the low quality review queue. That's all that needs to be done really, there's no need to discuss the inner details of why a post is bad. Some people on meta are obsessed with this. But apart from spam, rudeness and similar that call for moderator attention, we don't need to categorize crap. Either something should be removed from the site, or it should not. The only thing that's important is that crap is removed from the site in a somewhat timely fashion. Preferably handled by the community as far as possible, so that moderators can focus on more important things. I don't quite see why tag experts would be needed to do these reviews. As we all (might) know there is this awesomely designed flowchart from Shog's question here: Help us test question triage! And we all know the fatal flaw with the VLQ flag that falls within the freehand circle. As a newly 2k+ user I gave a shot at the Helper queue and found my fair share of VLQ questions, which I flagged with the appropriate link, only to see them again 10 review items later. Especially the latter would make users more prone to click "Should be improved" as there is no real consequence to it. They are not sure that it "Looks OK" and might be reluctant to choose "Unsalvageable" as their own posts may show striking similarities to the post they are reviewing. I think the Triage queue can do a good job at shifting out the real crap from the VLQ, say the worst 10%. 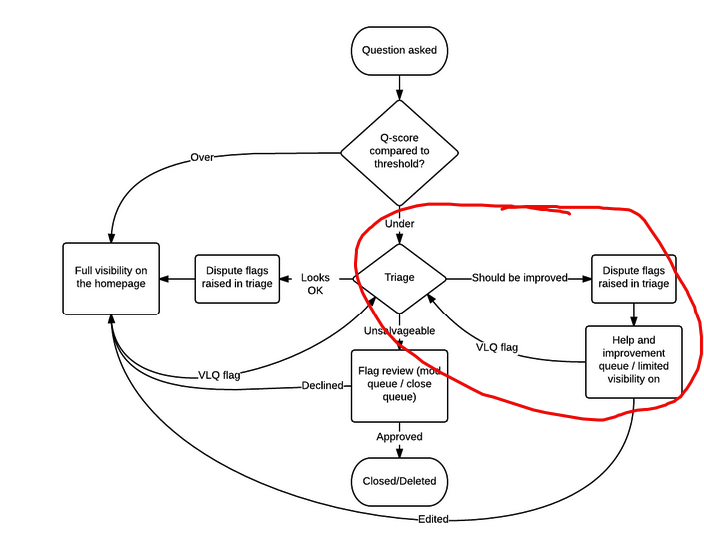 (It would be nice to see what percentage of VLQ flags that go into triage actually result into "Unsalvageable") Now we could argue that this is the worst kind of garbage that comes with a VLQ flag attached to it, so why should we bother putting that into the close vote queue, when already 3 users decided this is beyond any help. Hence straight up delete a post when it amassed three "Unsalvageable" votes form Triage. I think the diligence of putting it in the close vote queue is just abundant, as most likely triage users err on the safe side and rarely use the "Unsalvageable" option as I reasoned before. (Statistics to (dis-)prove me are welcome.) This would deal with Shog's notion that garbage tends to linger around the site for too long. Now as to whether or not we need tag experts or just all-round experts to judge the now remaining "Should be improved" flags is the last step. To edit posts into general shape, mostly no domain knowledge is needed. Adding images inline, apply code formatting, reduce the occasional "Thank you for you help" and whilst at it improve some grammar and spelling, is something most of us can do in the Helper queue. Then of course there are questions that are flagged "Should be improved", but are in no way near an actual question, or something that barely resembles an answer. One with domain knowledge is by default better able to judge these edge-cases and is certainly better able to find a duplicate to close against. But isn't that where the Hammer and down/close vote are for? For questions that look well formatted, appear to be an actual question, and not some rambling about a vague problem without a desired result or any attempt at a solution. There is already power for those with domain knowledge to get these "pseudo-questions" out of the way. So I say we should remove the VLQ link from the helper queue as there really is no use for it and substitute it with the close flag menu. We can then keep Triage as a real Triage, separating the absolute garbage from the rest, and the Helper queue can either whip the remainder into shape or get rid of it. No, we should not. We should let the garbage be shifted out by anyone willing to help (a.k.a. the Triage review). They can get rid of the real crap. What then remains as not up to standard ("Needs Improving") can be handled by anyone through the helper queue in which they either edit questions into shape or flag to close them. Domain experts can then use their normal tools to get rid of questions that were edited from the helper queue, but still make no sense by using close flags and down/close votes. I like the idea about content-specific VLQ-ness. Anyone with any meaningful experience in the field will recognize that the above "answer" is pure technobabble garbage, but someone who is computer illiterate might not. I don't think many of the mods here are computer illiterate, but I still get the impression that they would probably decline a VLQ or NAA flag on such an answer. Is this what you are talking about when you speak about tag experts reviewing VLQ flags? flags should not be used to indicate technical inaccuracies, or an altogether wrong answer, as long as the answer demonstrates minimal domain knowledge as would be expected of an educated person with entry-level skills in technology. Then, utterly incompetent answers can be marked as VLQ or NAA, and answers that are incorrect, but require more than basic computer skills to recognize as incorrect (e.g. claiming that strings can be made mutable in Java with a special compiler directive) would still be downvote-only. One problem with this, however, is the inevitable debates on how much content knowledge should be expected of a minimally competent (that is, non-NAA/non-VLQ) answer. Should we require a basic "newb" level where one can play around with things that one barely understands but probably knows enough not to cause a major catastrophe? Enough knowledge to get an entry-level job? One year of experience in the field? Ten years? Major guru? God incarnate? Whether an answer is not even wrong sometimes requires understanding the question, but most answers that should be deleted don't fall into this: link-only answers, follow-up questions, thank-you notes... So while topic experts do sometimes have an edge, that's only in a small minority of cases. Silver tag badge holders may be useful as fallbacks for disputed cases, but in the general case I don't see the point. There's also the serious problem of all those questions that don't have any tag with enough silver tag badge holders who are also active reviewers. Are they relegated to a cesspool? Sorry but this idea sounds a lot like you had a hole to fill, and you had a peg you wanted to get some use from, but that peg just doesn't have the right shape for the hole. One problem I see is that very often "very low quality" includes wildly wrong tags. Placing the moderation mostly in the hands of parties interested in totally unrelated tags doesn't look sensible. Before implementing this, why not asking the would-be-reviewers beforehand if they actually agree with the ultimate action taken? This is some thought about how the experiment could unfold, but maybe taking the list of flags handled by moderators and review queue, both declined and approved and present the test subject what actions they would take on the presented post (keep, edit, delete, or skip) and why. I would like a two pronged test with a group shown all the context and another that they have to click, but I'm unsure if there would be enough users to try that. I think that would be more convincing along the way. Not the answer you're looking for? Browse other questions tagged discussion flags low-quality-posts moderator-abilities . Happy 10th anniversary Stack Overflow! Commence … au festival! Is an unsalvageable question a very low quality question? Why can this answer be flagged as “very low quality”?